This story was published in partnership with Fast Company. EPA, the RLDF and the fund’s donors did not respond to MapLight’s requests for comment. Much of RLDF’s work resembles the “Rule of Law” campaign Pruitt began as president of RAGA. As part of the campaign, state attorney generals challenged Obama administration policies on the environment, health care, immigration and the financial industry. 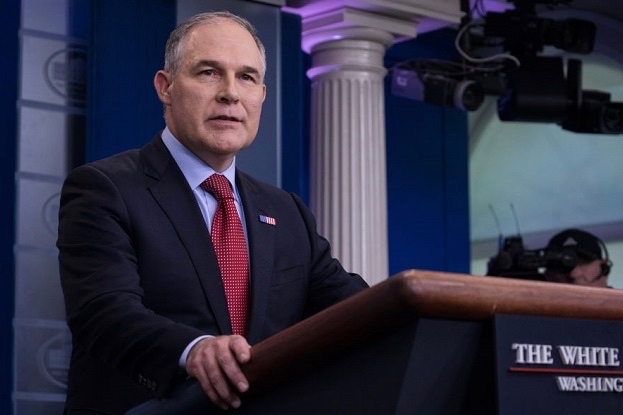 Pressed by Democrats about his pledge to recuse himself from any active cases he was involved in as attorney general, Pruitt said in early May that he will not participate in the Clean Power Plan appeals court case — although the EPA reportedly has already drafted language to repeal the rule. 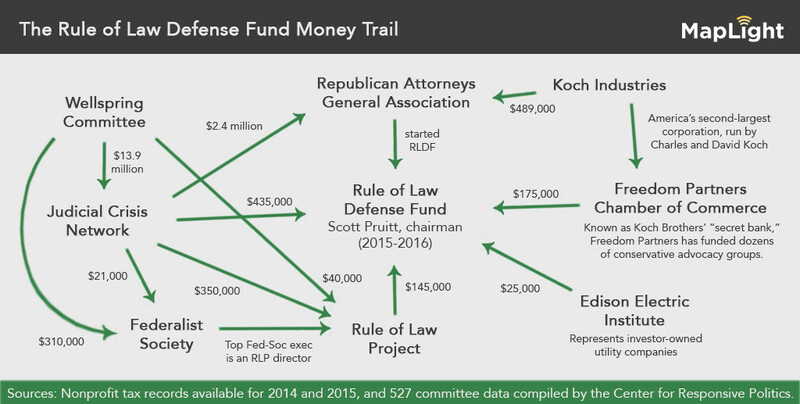 The Rule of Law Project (RLP), another dark money organization, gave $145,000 to RLDF in 2014, according to tax records. JCN also has given RLP at least $350,000 — or 70 percent of the funding the organization reported receiving between 2014 and 2015. There is only one publicly disclosed donor to Wellspring, which is closely tied to JCN — Wellspring’s president is married to JCN’s treasurer. Tax records show Wellspring gave RLP $40,000 in 2014 and 2015, and also donated $310,000 to the Federalist Society. Freedom Partners Chamber of Commerce gave $175,000 to RLDF in 2014 — a connection that was highlighted by Democrats during Pruitt’s confirmation process. The dark money group has been linked to the Koch brothers. Freedom Partners has helped fund dozens of conservative advocacy organizations. Altogether, the donations disclosed by JCN, RLP, Freedom Partners and EEI add up to at least $780,000. RLDF reported receiving $1.8 million in donations in 2014 and 2015. A super PAC tied to Pruitt, called Liberty 2.0, received almost half of its funds from the energy industry, Oklahoma Watch has reported. The industry accounted for 27 percent of the money raised by Oklahoma Strong Leadership, a Pruitt-affiliated PAC. Graphic by Andrew Perez and Margaret Sessa-Hawkins.